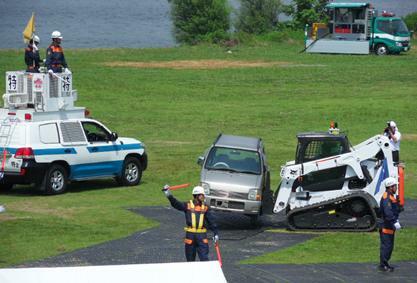 Bobcat compact track loader and attachments had an honor to make its debut at the annual Disaster Security Comprehensive Training by Tokyo Metropolitan Police Department (Keishichō). The training was held on July 14th 2016 at the riverside of the Edo River. The purpose was to train Riot Polices, Air Corps, Patrols, and rescue dogs by providing a rescue drill with a simulation of various devastated circumstances such as a flooded river due to a heavy rainfall or a landslide from an earthquake. The Disaster Security Comprehensive Training is one of the biggist disaster relief and rescue trainings in Japan. Japan Tokyo Metropolitan Poice Department has been helding this training every year, and it is also broadcasted live from the public broadcasting companies. Having participated in such demo is very meaningful privilege for Bobcat to be part of its community service. Bobcat’s Compact Track Loader T650 equipped with the Radio Remote Control Kits & Roller suspension carriage option successfully demonstrated various rescue operations using the pallet fork, bucket grapple, and combination bucket. The key operation areas for Bobcat compact track loader are devastated roads and residential areas blocked by damaged vehicles and debris with cracked surface caused by earthquakes. The disaster relief application package includes one Bobcat compact track loader with several attachments including Bobcat rotating grapple and pallet fork. Non Bobcat machines including wheel loader and drainage machines are also added to the overall operation. When it comes to the reality for any kind of rescue operations, timing is everything. And the demonstration proved that the Bobcat T650 significantly reduced the time during the operation. Its versatility and the remote control functionality maximized the operation ability as well as mobility and agility. The compact size with small rotating angles ensures the optimal performance in any narrow area, and the horsepower is stronger than wheel loaders. The Rotating grapple successfully removes obstacles in devastated areas, and pallet fork carries numerous products in the site. Disaster management & rescue operation is heavily specialized application where the extensive professional knowledge regarding disaster and the government scale of management are involved. For this reason, the major customers are public institutions or government ministries holding major investment projects, so trustworthy partnership and the brand value are also very important. Bobcat team in Japan looks forwards to continuing on building up experience and expertise in this sector to by having more demo and community service involvement.